Both the men and women’s cross country teams have broken records, marked personal bests and overall, ran well this season for the University of Wisconsin–Stout. This success has come from great individual performances and perseverance by both teams. The best finishes for each team came in the Woody Greeno Nebraska Invitational at the University of Nebraska–Lincoln. 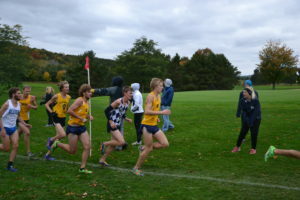 The men’s team took the number one overall spot among 13 teams, while the women’s team took second overall among 14 teams. All of the teams’ success has come from determination and goal setting. For the men’s team, academics has been a primary goal. “We always have been an academically minded team, so one of our main goals for the season was to have everyone on the team above a 3.0 GPA.” says Devin Sauvola (So, Eagle River, Wis.). The WIAC Cross Country Championships will be Saturday, Nov. 1 at the Ettrick Golf Club, in Ettrick, Wis. Both teams look to put up good times and to advance to regionals.